Meet the team at work in the lab on Direct Fusion Drive! The Living Universe is both a feature film for IMAX theaters and now a four-part documentary series. We blogged about our interviews in January and the series is now available on Curiosity Stream, a service dedicated to documentaries! Episode 2,”The Explorers” features a segment on DFD narrated by PSS engineer Stephanie Thomas, in addition to discussing plasma and antimatter propulsion. Here is an article about the series from Broadway World. You need to sign up for an account on Curiosity Stream to watch, which is free for 7 days and then $3 per month. “The Encedalus Mission” by internationally best-selling hard science fiction author Brandon Q. Morris was originally written in German, and features the DFD as the propulsion technology on a mission to study newly detected life in the Saturn system; an array of six DFDs power the spaceship. Early reviews are favorable! The book is available in paperback or for Kindle. Send us a comment and tell us what you think if you watch the show or read the book! Phase II NASA STTR on superconducting magnets selected! We are pleased to announce that our Phase II STTR proposal, “Superconducting Coils for Small Nuclear Fusion Rocket Engines,” was one of 20 selected for award by NASA in this year’s round! The full list of winners is posted on NASA’s website. We will be building a testbed with a split-pair superconducting coil (two windings with a gap between them) and performing experiments to assess the impact of operating the magnets in the vicinity of the FRC plasma. Applications of the technology go beyond fusion reactors, for example science payloads and high-performance motors for hybrid electric aircraft. At long last, we have a professional animation explaining how the Direct Fusion Drive works. Enjoy! The paper … is an interesting, well-written paper that uses PIC to build upon earlier direct numerical simulation methods based on molecular dynamics. The authors present a clearly written discussion of the scaling properties of slowing down theory to support their numerical studies. The authors do a very good job describing the simulation approach they take… Of particular note in the paper is the good agreement between their numerical data and the sub-thermal model even when the effective computational log(lambda) was on the order of 1… the authors did not stop with their results but instead applied their conclusions to the FRC reactor, predicting that the neutron production rate is 100 times lower than a conventional DT Tokamak. This paper is key to the low radiation levels claimed for our PFRC design, and hence the Direct Fusion Drive. The fast ion slowing-down is what causes the tritium and other fusion ash to exit the machine. You can view a preprint on arXiv. We will post again once the paper is published and available from Physics of Plasmas. Back in early September, PSS and PPPL were visited by a film crew from Australia. The project? Living Universe: An Interstellar Voyage, which will include a feature documentary, a 4 episode TV miniseries, and a podcast. The documentary touches all aspects of an interstellar mission, from exoplanets to astrobiology, including transportation – which is where our fusion engine work comes in. The film is in production now and the producers expect to launch in late 2018. The PFRC experiment at PPPL is the only hardware the documentary team could find with a path to fusion propulsion! Dr. Cohen was able to run the machine for the film crew, and both Mike and Stephanie were interviewed extensively. We discussed the rocket equation and the fundamental speed of fusion products, and how DFD moderates that speed with additional propellant to produce higher thrust. For an interstellar voyage, DFD would have to be much, much lighter than we know how to make it today – but who knows what innovations in magnets are possible in the future! How will you be able to watch the film and TV series? The film should do the rounds of museums and IMAX theaters. The TV series will be available for streaming from Curiosity Stream, a service which specializes in science, history, tech & nature documentaries. We will post an update when we have a firm release date! We are pleased to report that an additional patent has been awarded for DFD! 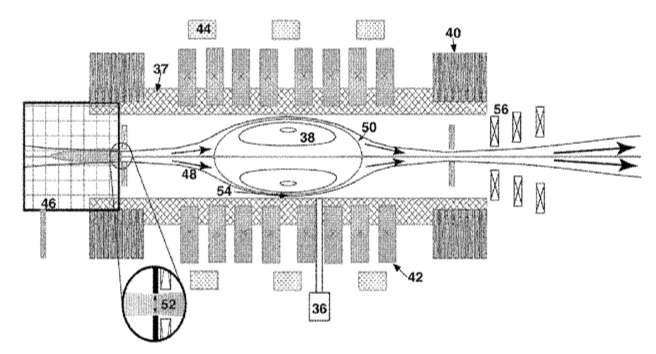 US Patent 9,822,769, “Method and Apparatus to Produce High Specific Impulse and Moderate Thrust from a Fusion-Powered Rocket Engine”, was published on Nov. 21, 2017. It’s now available from the US patent office website! Here is a link to the patent from the Department of Energy’s Energy Innovation Portal! The inventor on the patent are Dr. Cohen, of PPPL, and three PSS engineers: Gary Pajer, Michael Paluszek, and Yosef Razin. The first patent, “Method to Reduce Neutron Production in Small Clean Fusion Reactors,” was issued on September 9, 2017. The patent is available on Patentscope.